If you're looking for a good deal on cell phone service, Walmart might not be the first place that comes to mind. However, the gigantic store where customers can buy everything from cereal to lawn furniture also offers a number of cell phones and plans that extend beyond what you can find directly from national carriers. Indeed, particularly for users who prefer prepaid or lower-use options, Walmart may prove to be a great value for cell phone service. Designed primarily with families in mind, Walmart Family Mobile operates on the T-Mobile network, providing nationwide coverage and service. There are phones to "suit every family member," including basic phones and quick messaging phones with keyboards, as well as smartphones. 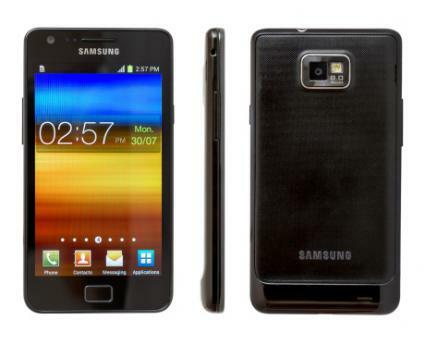 Handsets available as of March 2013 include the Samsung Galaxy S II, the HTC Wildfire S, and the Alcatel 606A, among others. Pricing for the phones ranges from $20 to $300 with no contract. The main and simplest plan offered by Walmart Family Mobile is the $40 a month unlimited talk, text and web plan. That includes virtually unlimited everything for the first phone with additional lines adding $35 to the monthly bill. Although the plan says that it provides unlimited web, it really only provides up to 1GB of shared web access at 3G speeds. Beyond that, wireless data falls down to the 2G network from T-Mobile. A one-time $25 starter kit is required for each line. Reviews on the Walmart website indicate that the service is a "good value for cell users," especially "when you are not tech- friendly." The service "is limited," but it is "good for saving money." A growing player in the prepaid cell phone market is a company called TracFone, for which it is oftentimes possible to find free airtime codes to get started. 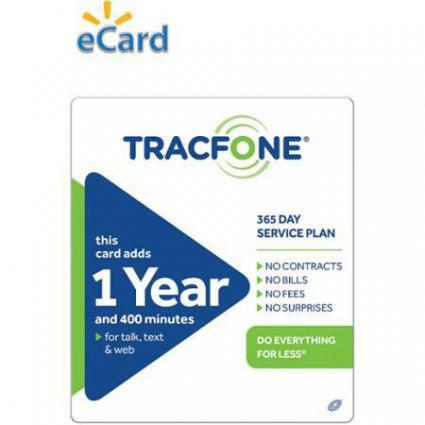 TracFone operates under several brand names, each of which is offered through Walmart. These include Straight Talk, NET10, and the TracFone brand itself. 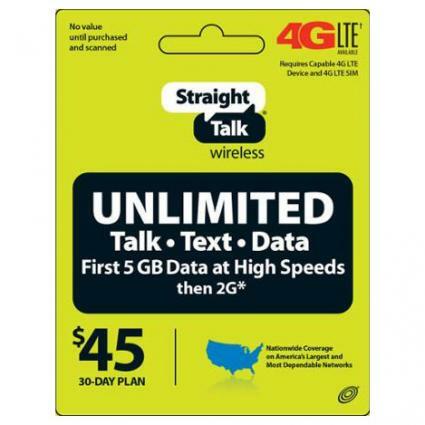 As a joint venture program between Walmart and TracFone, Straight Talk Wireless focuses on providing cell phone service with no contracts. It works as a Mobile Virtual Network Operator (MVNO) with the Verizon wireless network, providing relatively inexpensive phone plans on a mostly prepaid basis. As of March 2013, some of the phones sold through Straight Talk include the hugely popular iPhone 5, the Samsung Galaxy Proclaim, the LG Optimus Dynamic, the Motorola Defy and the ZTE Merit Z990G. The selection is quite varied, including more basic feature phones, as well as a range of Android smartphones. Pricing ranges considerably, as the more basic phones can be purchased for less than $100, whereas the iPhone 5 sells for more than $600. This is because the phones are not subsidized by a contract. The base $30 plan is valid for 30 days and includes 1,000 nationwide minutes, 1,000 nationwide messages, 30MB of data and no contract. The unlimited monthly plan is $45. It includes unlimited talk, text and mobile web. There is also a $60 unlimited international plan that includes unlimited international calling as well. There is better value to be had by prepaying in advance, with options for 3 months ($130), 6 months ($255) or one year ($495), all of which are equivalent to the $45 per month unlimited plan. Cult of Mac goes so far as to say that Straight Talk is "the best prepaid carrier you can possibly choose in the United States," giving you "fantastic coverage, blazing fast 3G speeds and no monthly contract." Also operating under TracFone is NET10 Wireless. The cell phone selection is similar to Straight Talk and the main TracFone brand, including such handsets as the LG Optimus Logic, the Samsung Galaxy S II, the ZTE Merit, and the Motorola W409G flip phone. It is also possible to bring your own phone if you buy a SIM card from NET10. Again, as there are no contracts and no subsidies, the pricing on the phones can get as low as $29.99 and as high as $500 or more. 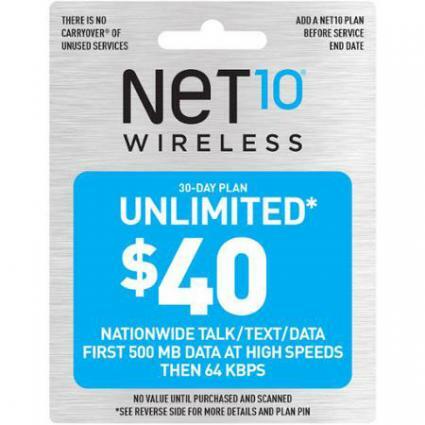 There are three main types of plans offered by NET10 Wireless. Family plans allow for up to four people, providing unlimited calls, text and data with no activation fees. The first phone is $50 a month (or $45 on auto-refill), going up to a total of $170 for four people (or $165 on auto-refill). 30-day monthly pans start at $15 a month for 200 minutes with carryover, ranging up to $65 for unlimited international talk, text and data. The highest plan is $60 when placed on the auto-refill system. Pay-as-you-go plans allow for airtime and service days carryover. The smallest top-up amount is $20 for 200 minutes with an expiration period of 30 days, going up to $100 for 1500 minutes over a 180-day period. Customer reviews of NET10 on Viewpoints.com are satisfactory, giving the wireless provider an overall rating of 65/100 as of this writing. The phones "aren't super fancy," but you do have "total control" of your monthly allowance. Value plans are paid on a monthly basis, starting at $9.99 for 50 minutes and nationwide coverage. Family value plans are priced similarly with additional phones starting at $5.99 each for 40 additional minutes. Pay-as-you-go airtime cards have expiration periods ranging from 30 days to 365 days, depending on the value added. The cheapest is $9.99 for 30 days with up to 30 minutes, getting as high as $199.99 for 365 days with up to 1500 minutes included. On PrepaidReviews.com, comments about TracFone Wireless are mixed. User "Microbe" writes that "service has been reliable with very few dropped calls," but the "accounting for minutes is weird... sometimes minutes just disappear inexplicably and TracFone personnel can never explain it." In addition to the main Walmart cell phone services provided through TracFone and Walmart Family Mobile, the retailer also sells cell phones and cell phone plans from other wireless providers. These include Verizon Wireless, AT&T, T-Mobile, Virgin Mobile, Jitterbug and Cricket. In this way, Walmart can be a good place to shop around for the best possible option without having to go from store to store.